With more than 70 employees and a brand new single stream recycling center, the O.T.C. has created one of the most efficient, cost-effective recycling programs in New Jersey. Our current services include collecting recyclables from homes throughout Burlington County and providing recycling services to military installations in South Jersey. 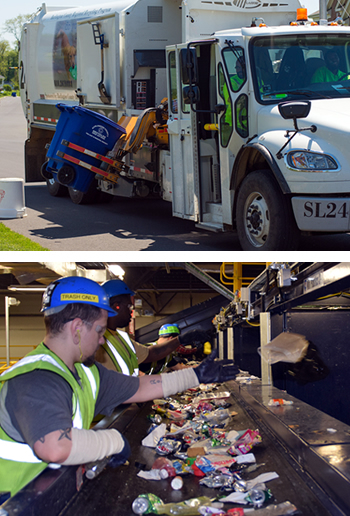 We’re proud to train and employ adults with disabilities and these skilled individuals make up the majority of our recycling workforce. Our teams are energetic and enthusiastic individuals who are excited about the opportunities available through our updated recycling program. These skilled workers are trained in curbside collection, sorting, or baling for shipment to recycling mills and work under the supervision of crew leaders who maintain stringent safety standards and exceptional quality control. Here at O.T.C. we pride ourselves on providing the most efficient, cost-effective, and ecological practices to all of our clients. We’ve recently updated our recycling program to accommodate the growing needs of our new and existing clients and look forward to serving all of your recycling needs.